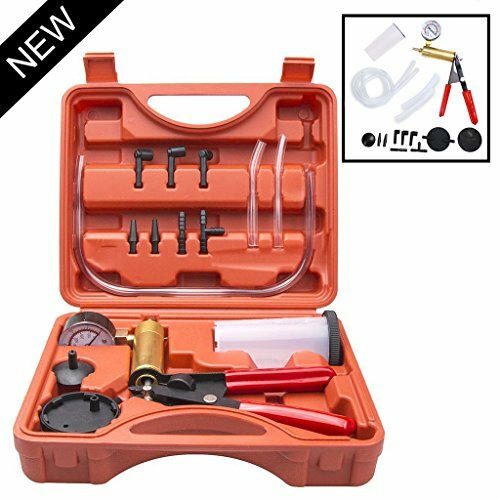 Brake Bleeder and Vacuum Pump Tester 2 in 1 Tool Kit Bleed your brakes yourself without the mess, works with all vehicle and models. 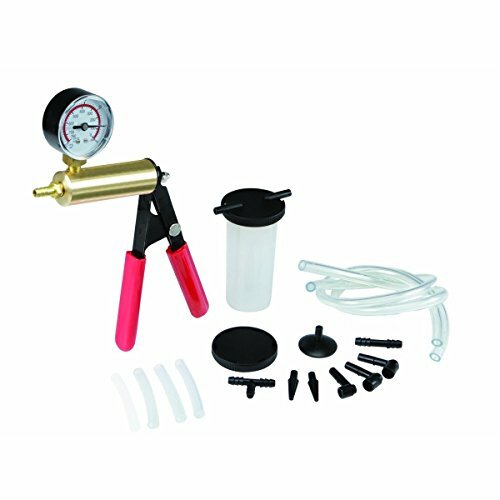 INCLUDES: Gauge Scale 0-30 Inches HG 0-76 CM HG 2 Vacuum Hoses 1/4" ID X 23" LONG 2 Vacuum Hoses 1/4" ID X 3" LONG 2 Tapered Hose Adapters 1 T Hose Connector 1 Straight Hose Connector 3 Brake Bleeder Valve Adapter 1 Universal Cup Adapter 1 4 0Z. Reservoir Jar 2 Jar Lids NOTE: This product cannot achieve a full vacuum of -30"Hg though the gauge does show to that level. Brake bleeding does not require that deep of a vacuum. HFS is a TradeMark of Hardware Factory Store Inc. This Item is not allowed to be sold by any other seller in Amazon. ●Clean-collects old brake fluid without spillage. ●Customer Service： 1. Office hours: Monday to Friday 9:00am to 3:30pm (Pacific Time). 2. We will reply your message within 24~48 hours. ● Shipping： 1. Monday to Friday (orders placed before AM8:00) will be shipped within 24 hours. 2. Orders placed after Friday AM8:00 or national holiday will be shipped on the coming business day. 3. Buyers responsible for all custom and brokerage fees for shipments outside of the United States. ●30 Days Money Back Guarantee： 1. Customer MUST contact us within 30 days after the purchasing. 2. Item must be sellable condition with the original packaging. Fees may apply if item is determined as not original condition. 3. Buyer should be responsible for the return freight. 4. 20% restocking fee is NON-REFUNDABLE under any circumstances. ● Warranty： 1. Most of items which were marked "warranty" on the selling page apply to the warranty policy. Some item is not included. 2. Warranty period: 1 year 3. The warranty only covers the defects under normal use. 4. The warranty DOES NOT cover the defect was subjected to misuse, negligence or accident. 5. The warranty DOES NOT cover consumable parts. 6. EWK reserves the right of final decision. 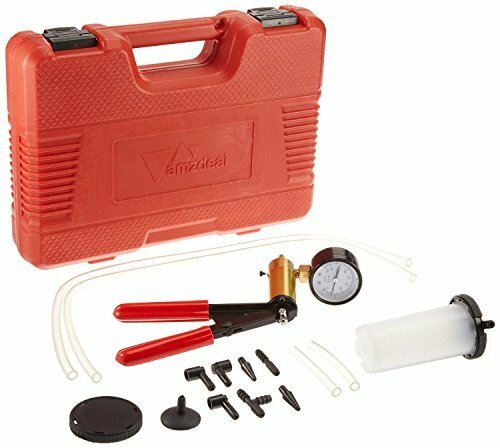 Skip the auto shop and do your own brake services with the ABN® Universal 2 in 1 Vacuum Pump & Brake Bleeding Tester Kit. It is universal for all vehicles and is constructed with a solid brass cylinder, cylinder head, and piston with anodized steel handle frame. 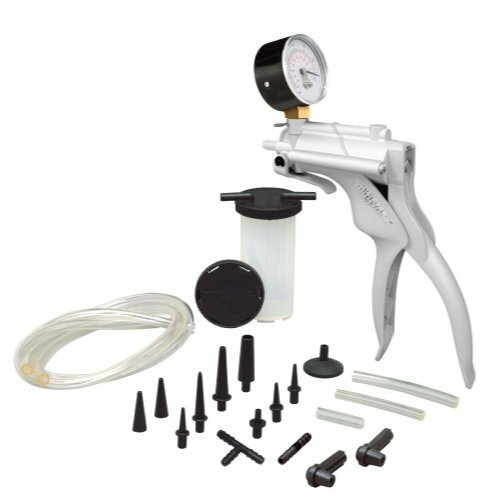 The kit features 90-degree tapered adapters that fit wheel cylinder/caliper and master cylinders, cushioned pistol grip handle on the vacuum pump, and tapered barbed hose fitting for the vacuum pump. This kit can even be used to can food with an airtight seal since the tube and catch jar hold the seal with no loss of pressure. 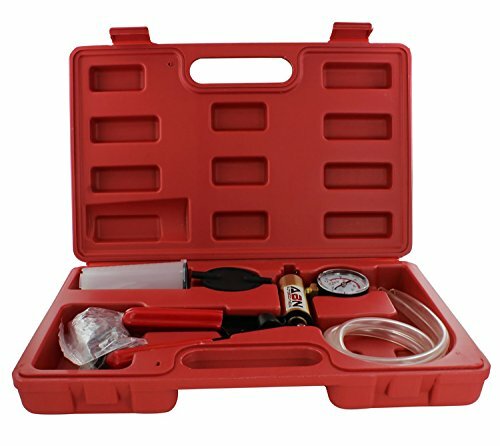 Included in this package is a pump with precision gauge for testing and servicing pressurized systems, two 2-foot tubes, multi-use adapters, and brake fluid reservoir all packed inside a carrying case. Lincoln Lubrication Industrial Vacuum Brake Bleed Kit is designed to operate with compressed air to bleed up to 2 quarts per minute. 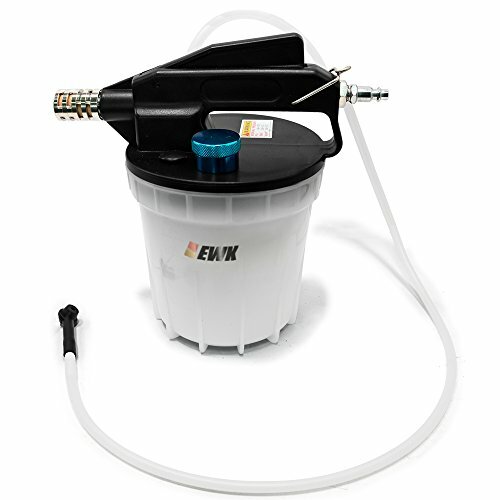 It features 1.8 liter capacity fluid collection reservoir and includes automatic master cylinder refill kit with 40 oz. reservoir. 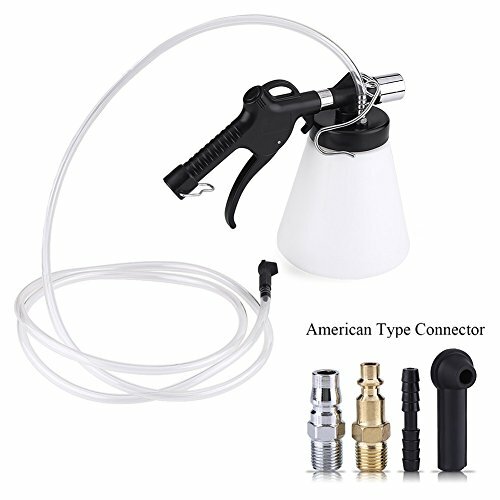 This kit has variable control thumb throttle that maintains desired flow rate and contains include 6 feet bleed hose, master cylinder evacuation hose, hanging hook and bleed adapters. 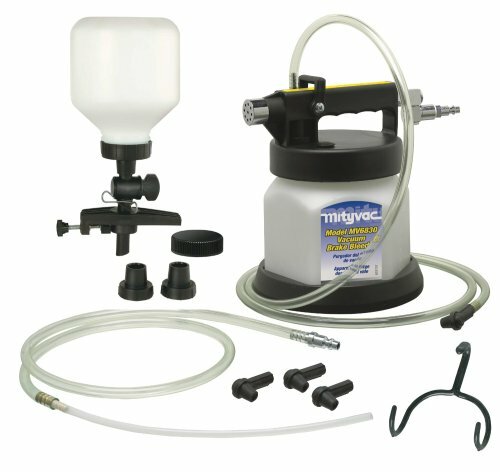 This is the original Mityvac hand vacuum pump kit used by service professionals worldwide for performing hundreds of automotive diagnostic and mechanical tests and for one-person brake bleeding. 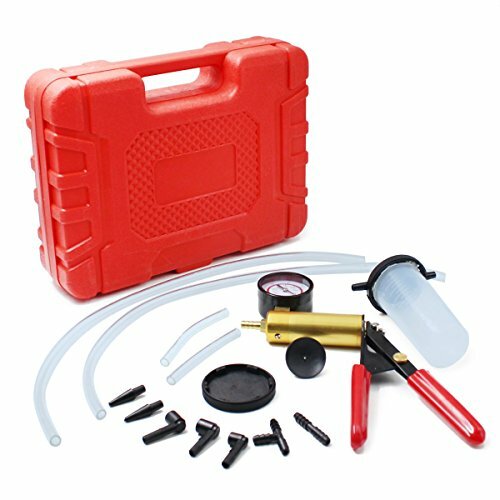 The MV8000 kit contains our most popular Selectline hand vacuum pump with vacuum gauge and accessories. 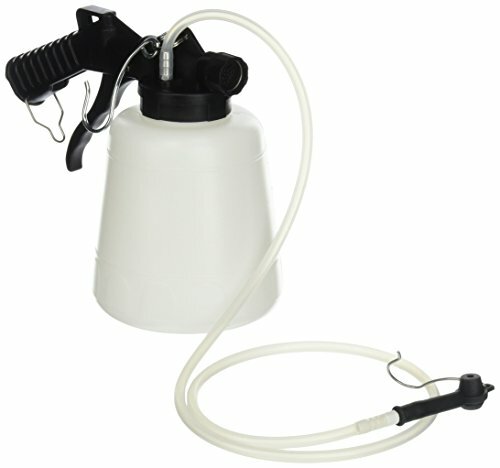 Compare prices on Brake Fluid Vacuum at ShopPlanetUp.com – use promo codes and coupons for best offers and deals. We work hard to get you amazing deals and collect all available offers online and represent it in one place for the customers. Now our visitors can leverage benefits of big brands and heavy discounts available for that day and for famous brands.